There are only two methods of editing. Which one do you use? Find out what they are and decide…are you a Swooper or a Basher? 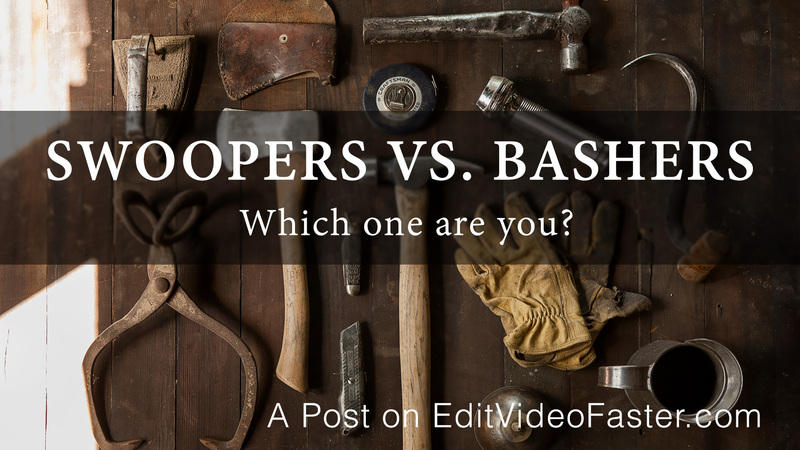 Are you a Swooper or a Basher? Before leaving for vacation I was listening to Tim Ferriss’ podcast. He was interviewing Rolf Potts and they discussed author Kurt Vonnegut’s concept of “Swoopers and Bashers” when it comes to writing. This idea states that writers can only write in one of two ways: by swooping or by bashing. I believe the same theory can and should be applied to video editing too. What are Swooping and Bashing? I bet you swoop and/or bash without even knowing it. Each is a method you use to edit your videos (or write books, create graphics, etc.). The Swooping method is to do a major portion of the work very roughly then refine, refine, refine. 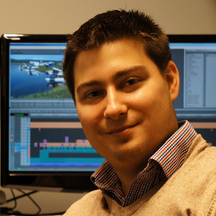 Think about it this way… First, do a super rough cut. The shots are essentially just laid next to each other without much thought. Then you do another cut. The shots line up better and the story starts to make sense. You do another cut where it’s pretty much there. You start to sweeten the audio and do color correction. You repeat this process of “swooping” over the material and refining each time until you finish. Pros: This process is faster than Bashing. It’s kinda like 80/20ing your way through a project. Cons: I find I get much better videos when I bash my way through them, which I’ll get to in a minute. With Swooping I tend to be less creative. Since I already have a “working copy” of a video, why would I want to go back and add in some random effect in a bunch of places? Usually I’ll go back and add it in but I know there have been times where I haven’t. When I Swoop: I swoop in two scenarios. The first is when I’m under a tight deadline. I swoop in this case because I generally always have a “finished” version…it just depends on how “finished” I can make it before the deadline. The other time I swoop is when I don’t want to work on a project. I’ll admit it. I have (sometimes many) projects I absolutely don’t want to edit for one reason or another. If I swoop I can finish it faster and not go crazy working on a project I don’t want to be on. The Bashing method works by starting at the beginning and then “bashing” your way through the project. You complete maybe 95% of it on your first draft. Instead of doing many versions of a video completing little by little, you work in a more linear fashion pounding out frame after frame, minute after minute. Pros: This process will give you better results in my experience. I tend to be more creative. Cons: It could take longer. And it’s 10x more frustrating. Why? Remember staring at a blank screen when trying to write a paper in High School? After the first version while Swooping you have something to work with. When you bash the canvas is blank the entire time. When I Bash: I bash in two scenarios. First is when I have time. When I have time I can methodically work my way through editing the video. The second scenario is when I’m excited about the project/topic. The best work I’ve done is while bashing. The same applies to writing. My favorite post and the most popular post so far on this site was created by bashing. The founding of this site was created by bashing. I’m a Swooper and a Basher. Each has specific advantages and disadvantages. Swooping will get you there faster but Bashing will get you a better result. Now it’s your turn. Which one are you – a Swooper or a Basher? Why? After you write your comment on whether you are a Swooper or Basher can you do me two things if you enjoyed this post? First, send it to another editor who you think could benefit from it. Remember, this website is here to make the video editing community a better place. Second, type your email address into the box at the top right or at the bottom of the page if you want to get emailed about new posts. I come out with new posts every Wednesday and new tutorials every Friday. Thanks and I’ll see you on Friday or over on Twitter! !